Sugar Beach St Lucia, a Viceroy Resort is a world-renowned luxury 5 star resort set at the edge of a beautiful crescent beach at the foot of the majestic Piton Mountains as part of a UNESCO World Heritage Site amidst 192 acres of magnificent St Lucian rainforest. Without a doubt one of the most spectacular locations in the world – one visit is all it takes to see why the area has earned such a prestigious accolade. Luxuriously-appointed, the villa accommodations are located to give you privacy against a backdrop of lush greenery and towering trees, allowing you to instantly unwind and appreciate your stunning surroundings. The experience at Sugar Beach caters to every taste and requirement – from romantic retreats to family holidays. There is a full compliment of land and water sports to be enjoyed (for some an extra fee) including unrivalled scuba diving, pampering yourself in the Rainforest Spa and sampling the exquisite local cuisine. For the young ones there are excellent kids programs and babysitting services available, or if you would like to tie the knot here surely there is no better place and a number of great wedding and honeymoon packages are available. All of the rooms at Sugar Beach feature an unrivalled set of amenities as standard including: high thread count Egyptian cotton linen, complimentary internet access, large flat screen TV, tea & coffee making facilities, signature bathroom products, bar/refrigerator, plunge pool, butler service. Luxury Sugar Mill Rooms – Located in the heart of the resort, these rooms look out on the gardens and benefit from their own plunge pool. 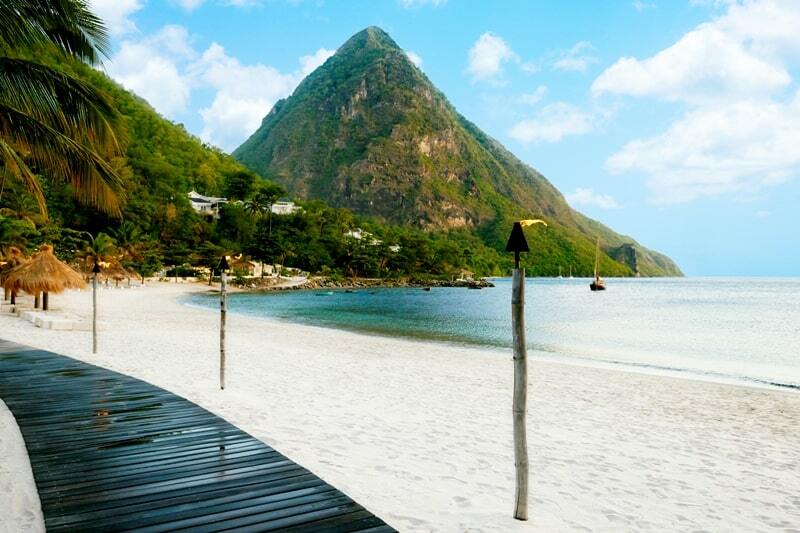 They are within easy reach of the beach and the main swimming pool, with the Pitons forming a dramatic backdrop. These sleep up to 2 people (+ cot). Superior Luxury Sugar Mill Rooms – These rooms have the same feature set and location as the Luxury Sugar Mill rooms, but also have a private roof terrace with commanding views over the Caribbean and the Pitons. These sleep up to 2 people (+ cot). Superior Luxury Cottage – Tucked amid the lush vegetation and fruit trees these accommodations offer enclaves of privacy, tranquillity and stunning views. The spacious bedrooms speak to the resort’s plantation history with high beamed ceilings and romantic voile draped four poster beds. The Luxury Cottages have breath taking views of the dramatic Pitons, or views of the sparkling waters of Anse des Pitons below. A separate living room provides further space to relax indoors, while outside a private terrace and plunge pool is an added bonus for those who like to bask in the warm Caribbean sunshine. The living room features a sofa bed, flat screen TV and other furnishings ensuring the ultimate in comfort. *This room category is equipped with a separate living area which accommodates a double sized sofa bed. Luxury Villas – Elegant and sophisticated, these rooms feature distinctive Caribbean styling while maintaining the beauty of their surroundings. 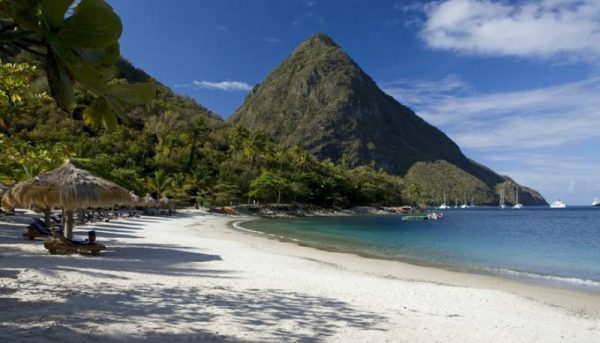 Private patios look out over the beach and the Pitons, and there is a private plunge pool for you to enjoy as well as hardwood flooring and a decidedly romantic four-posted bed. These sleep up to 2 people (+ cot). Superior Luxury Villas – Gingerbread styling and pastel shades combine in these spacious offerings. The master bedroom opens out onto the adjacent living area adorned with custom furniture and the large furnished terrace beyond. A private plunge pool completes the spec, as well as space for al-fresco dining. These sleep up to 3 adults, or 2 adults and 2 children (+ cot). Grand Luxury Villas – Exquisite levels of privacy and luxury as well as spacious rooms suitable for families and couples alike. These villa suites feature a contemporary styling and decor, with hardwood flooring and lavish furnishings throughout to create a unique and unforgettable experience. The living area opens up through French doors onto the furnished veranda with its private sundeck and plunge pool. These sleep up to 3 adults, or 2 adults and 2 children (+ cot). 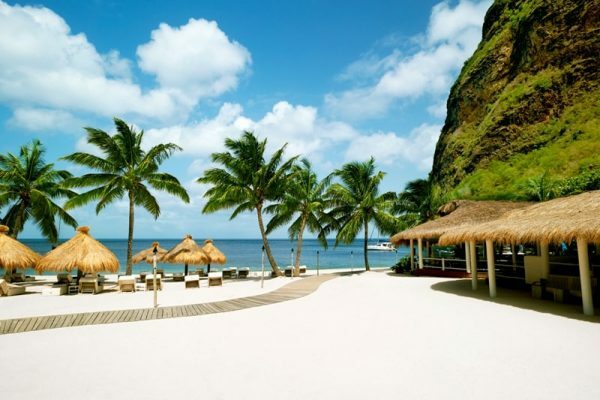 Two Bedroom Grand Luxury Villas – With spacious rooms and an unrivalled setting opening out to views of the pristine beach, glistening sea or the soaring Pitons, these rooms are a veritable paradise with a long list of modern conveniences and stylish furnishings. Great for larger groups or families, the two bedrooms have four-poster beds and dedicated en-suites. Two living rooms, two terraces and two plunge pools complete the generous specification. These sleep up to 6 adults or 4 adults and 4 children (+ cot). Two, Three and Four Bedroom Residences – These large private residences are fully self-contained, with some offering a private infinity pool. They are available on request and offer spectacular views and all of the luxurious amenities of the other room categories at Sugar Beach. They sleep either 4, 6 or 8 people (adults and children). 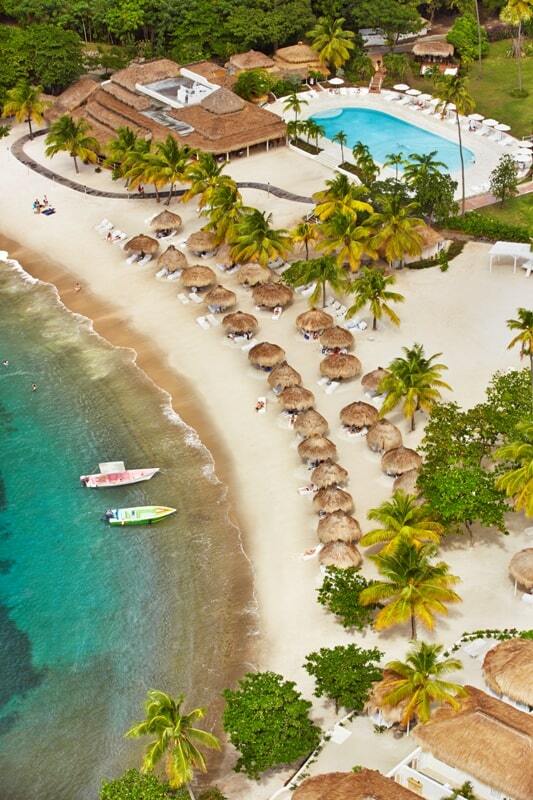 Meal Plans : Various meals are available at Sugar Beach including all inclusive. The Great Room – For the most discerning diners, the Great Room evokes old world colonial charm while serving up Caribbean-influenced delicacies in candlelit, air-conditioned surroundings. The Great Room is open every night for Dinner (6:30pm – 10:30pm). The Bayside Restaurant – Set on the white powder sands of one of the island’s most beautiful beaches, The Bayside restaurant features relaxed a la carte dining for lunch (12:30pm – 3:00pm) and dinner (6:30pm – 10:00pm). The Terrace – Set on the ground floor of the elegant Great House, with stunning views over the beautiful lily pond and onward towards the glistening Caribbean Sea. The Terrace offers an exceptional ambience for you to enjoy breakfast and start the day (7:00am – 10:30am). The Bayside Bar – Set right on the beach, the Bayside Bar serves bar food and drinks in a relaxed and easy manner, with a range of selections including pizza baked in a wood-fired oven and other international favourites. It’s a great place to watch the sun go down whilst enjoying a cold drink or two. Open 9:00am – 11:00pm. The Cane Bar – Sample the planet’s best aged rums in this new specialty St Lucian rum bar, designed with a chic white-and-charcoal palette, glowing white bar, and comfortable oversized furniture. The Cane Bar also serves up a selection of choice dishes to accompany your drinks. Dish selections may change according to market availability. Guests must be 18 years or older. Open 6:00pm – 1:00am. The Palm Court Lounge – serving up a range of cocktails, beer, wines and snacks as well as a selection of teas too. Open 3:00pm – 11:00pm. 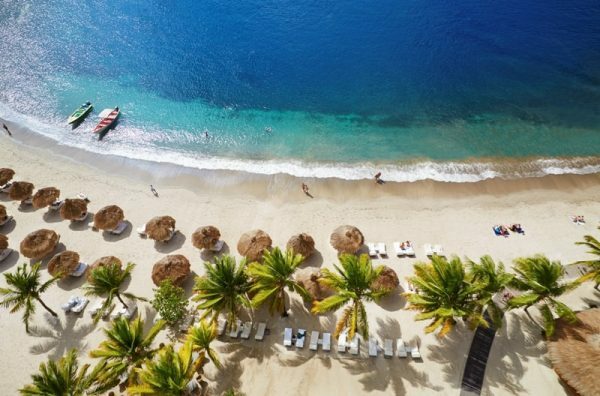 There is plenty to see and do on the island of St Lucia, and the resort offers you a wealth of activities both on sea and land. Some of these will attract a locally-paid fee. The complimentary non-motorised water sports include kayaking, paddle boats, paddle boards, wind surfing, hobie cats and pedalos. Motorised water sports available include water/mono-ski, wakeboarding, kneeboarding, banana boats (minimum 4 people), megawind and tubing. 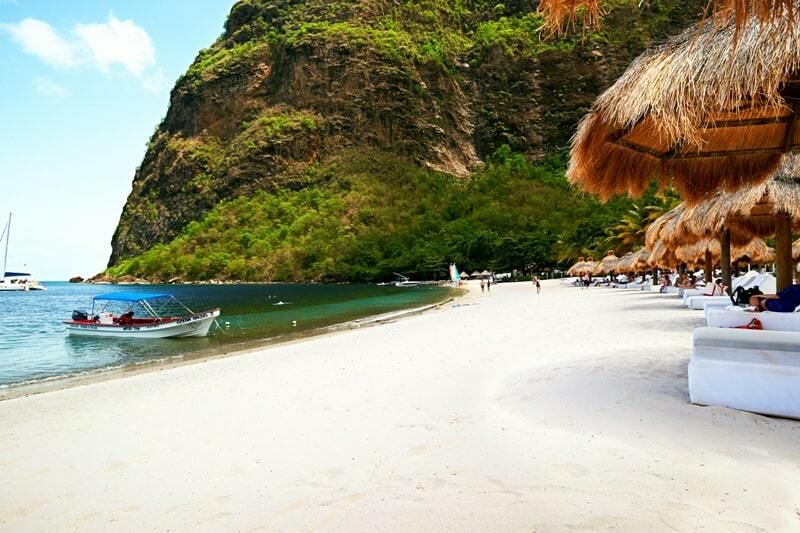 There is also fantastic scuba diving at Sugar Beach, or you can try your hand at snuba and snorkelling instead. Back on land you can enjoy tennis, archery, billiards, jogging and walking, beach volleyball and table tennis. 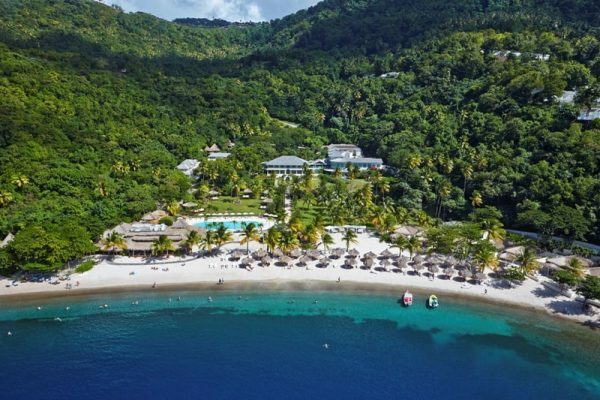 The Rainforest Spa at Sugar Beach Viceroy features tree house treatment rooms, an Amerindian steam dome, and specialist skin care clinic perched along a lively stream in the lush tropical forest at the base of Petit Piton. Treatments are designed to be as nourishing on the outside of the body as their ingredients are on the inside. Sugar Beach prides itself on being a family friendly resort, with a great range of supervised activities for little ones between the age of 4 and 12 years old at the Sugar Club. Children can have fun with treasure hunts, arts and crafts, archery, fish feeding and sand castle building down on the beach. This is a great place for children to have some fun and make new friends while mum and dad have some time to themselves. For the older children the Sugar Club has a pool table and games boards that have been placed downstairs. There is also a great range of water activities to enjoy including kayaking, paddle boarding and sailing. All of the kid’s activities are complimentary for hotel guests, but please note that children under 4 must be accompanied by a parent, guardian or a babysitter – if you would like babysitting this is available at an extra charge, and advance reservation is required.